Мисля че е време за отделна тема. Компания Virgin Galactic объявила о наборе пилотов-астронавтов. Об этом сообщается на официальном сайте компании. Кандидаты должны иметь опыт по управлению как крупными многодвигательными аппаратами, так и небольшими скоростными. Компания ищет пилотов как для самолета-носителя WhiteKnightTwo, так и для SpaceShipTwo. Среди прочего от кандидатов требуется "получать удовольствие от собственной профессии". Virgin Galactic предлагает всем желающим суборбитальные полеты до условной границы космоса на высоте 100 километров по 250 тысяч долларов. Компания была организована британским миллиардером Ричардом Брэнсоном. Разработанная Virgin система состоит из самолета-носителя и непосредственно космического корабля. Самолет выводит корабль с шестью туристами на борту на достаточную высоту, после чего аппарат отцепляется и самостоятельно продолжает полет. Сообщается, что клиенты компании в течение нескольких минут смогут испытать чувство невесомости. LOS ANGELES — Scaled Composites marked a dramatic increase in the test rate of Virgin Galactic’s SpaceShipTwo (SS2) by completing two glide tests over five days, including a 16-min. 7-sec. glide on April 27 that represents the longest flight to date. The latest flight is the third in succession to increase flight time, the last one on April 22 having extended the glide to 14 min. 31 sec. The back-to-back flights tested minor aerodynamic and control system improvements to the 60-ft.-long, 42-ft.-wingspan vehicle, which is in development for suborbital space tourism and science flights. The sudden surge in testing follows several weeks of weather-related delays, and has seen release altitudes from the WhiteKnightTwo mothership raised to 51,000 ft. and beyond. The higher altitudes provide more time to continue the flutter envelope expansion that began with the third flight in November 2010. The flights also evaluated stability and control, and provided pilot training for the Scaled test team. Glide testing is being used to refine the vehicle’s aerodynamics and low-speed handling qualities. Building on the incremental envelope expansion approach established with SpaceShipOne (SS1), the next test phase will involve higher-speed subsonic flight with a short burst of thrust from the Sierra Nevada-developed RM2 rocket that will power all vehicles. A follow-on flight-test phase, using longer rocket burns, will open up the supersonic, higher-altitude corner of the SS2 flight envelope. Once cleared, SS2 will move to suborbital flights. A final phase will involve extensive safety-of-flight and system robustness demonstrations for FAA Commercial Space Transportation operational approval. Ground testing of the RM2 also is accelerating with preparations under way for a further round of hot-fire runs of the engine following a sixth full-scale flight design RM2 test in late March. The run, which was the first since a hot-fire ground test in August 2010, continued evaluation of engine systems, fuel formulation, nozzle, motor structure and valve/injector performance. Scaled, which has a firm contract with Sierra Nevada for 50 RM2 engines, says the test met all objectives involving duration, igniter performance, oxidizer flow and pressurization systems. It also demonstrated successful collection of data-acquisition system measurements, structural evaluation, and nozzle ablation, as well as fuel regression rate and stability levels. Early on Wednesday 4th May 2011, in the skies above Mojave Air and Spaceport CA, SpaceShipTwo, the world’s first commercial spaceship, demonstrated its unique reentry ‘feather’ configuration for the first time. This test flight, the third in less than two weeks, marks another major milestone on the path to powered test flights and commercial operations. 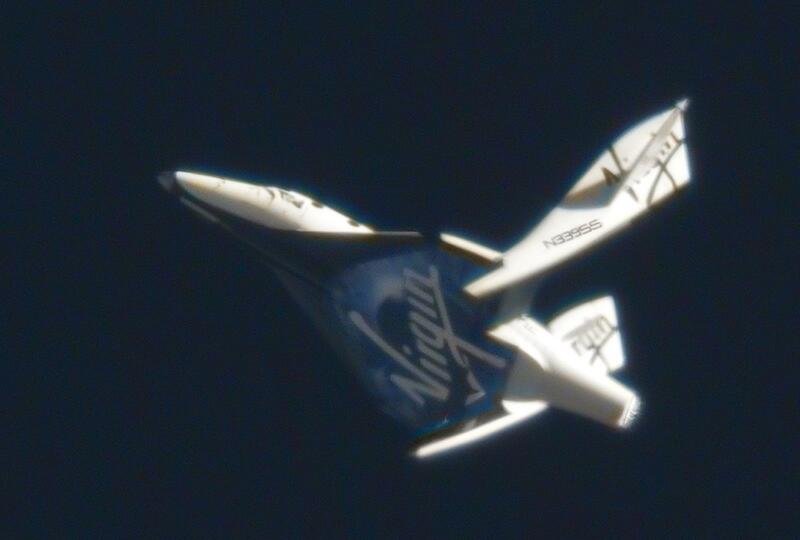 SpaceShipTwo (SS2), named VSS Enterprise, has now flown solo seven times since its public roll-out in December 2009 and since the completion of its ground and captive -carry test program. This latest flight saw a 6:43AM (local) runway take off for VSS Enterprise, attached to its WhiteKnightTwo (WK2) carrier aircraft, VMS Eve. At the controls of the of the spaceship were Scaled Composites’ test pilots Pete Siebold and Clint Nichols whilst Mark Stucky, Brian Maisler and Brandon Inks crewed the purpose built, all composite, twin fuselage WK2. After a 45 minute climb to the desired altitude of 51,500 feet, SS2 was released cleanly from VMS Eve and established a stable glide profile before deploying, for the first time, its re-entry or “feathered” configuration by rotating the tail section of the vehicle upwards to a 65 degree angle to the fuselage. It remained in this configuration with the vehicle’s body at a level pitch for approximately 1 minute and 15 seconds whilst descending, almost vertically, at around 15,500 feet per minute, slowed by the powerful shuttlecock-like drag created by the raised tail section. At around 33,500 feet the pilots reconfigured the spaceship to its normal glide mode and executed a smooth runway touch down, approximately 11 minutes and 5 seconds after its release from VMS Eve. All objectives for the flight were met and detailed flight data is now being analysed by the engineers at Scaled Composites, designers and builders of Virgin Galactic’s sub-orbital spacecraft. Perhaps the most innovative safety feature employed by SpaceshipOne and now SpaceShipTwo is the unique way it returns into the dense atmosphere from the vacuum of space. This part of space flight has always been considered as one of the most technically challenging and dangerous and Burt Rutan was determined to find a failsafe solution which remained true to Scaled Composite’s philosophy of safety through simplicity. His inspiration for what is known as the feathered re-entry was the humble shuttlecock, which like SpaceShipTwo relies on aerodynamic design and laws of physics to control speed and attitude. Once out of the atmosphere the entire tail structure of the spaceship can be rotated upwards to about 65º. The feathered configuration allows an automatic control of attitude with the fuselage parallel to the horizon. This creates very high drag as the spacecraft descends through the upper regions of the atmosphere. The feather configuration is also highly stable, effectively giving the pilot a hands-free re-entry capability, something that has not been possible on spacecraft before, without resorting to computer controlled fly-by-wire systems. The combination of high drag and low weight (due to the very light materials used to construct the vehicle) mean that the skin temperature during re-entry stays very low compared to previous manned spacecraft and thermal protection systems such as heat shields or tiles are not needed. During a full sub-orbital spaceflight, at around 70,000ft following re-entry, the feather lowers to its original configuration and the spaceship becomes a glider for the flight back to the spaceport runway. Таз тема вземи си я затвори! Това как да го разбирам!?! Ами ако не се правеше на луд в последно време, можеше и да вдянеш! ПИШИ НА БЪЛГАРСКИ БЕ ЧОВЕК! Вече ще спамя всеки пост който напишеш на друг език освен български! Както вече ми писна да пиша, в форума се пише на три езика-български, руски и английски. И никой не може да иска специално да се превежда! Това го пиша за последен път и повече разяснения няма да давам! Моля администратора, ако си е на мястото, да вземе спешни мерки срещу това чуждоезично безумие! а ти Ang се успокой и да завързваме диалог по темите. Пък аз когато имам възможност ще поствам под чуждоезичните постове същите, но на родния ни език. Става ли? Администратора си е казал одавна думата ама няма кой да чете Няма вече да повдигам този въпрос, за мен той е решен! Моля спазвайте правилата на форума. Поздрави! 1.1. Препоръчително е да пишете на кирилица !!! 1.2. Постове и новините на други езици - английски, руски и др., да се публикуват само линковете към тях, и ако е възможно - заглавията да са преведени на български език. Школьник из Калгари может стать самым юным в истории человечества космонавтом. На настоящий момент в программе Ричарда Брансона, создателя и владельца компании Virgin, зарегистрировалось 440 человек - кандидатов на полет в космос по первому негосударственному проекту. Имя кандидата в прессе не называется, но турагент Майкл Бродхерст подтвердил, что на сегодняшний день канадский тинейджер - самый юный в списке кандидатов на полет корабля фирмы Virgin Galactic, передает Torontovka.ru.